Weinstein Hall is a dynamic and diverse community just off of Washington Square Park in New York City and houses almost 600 first year students. 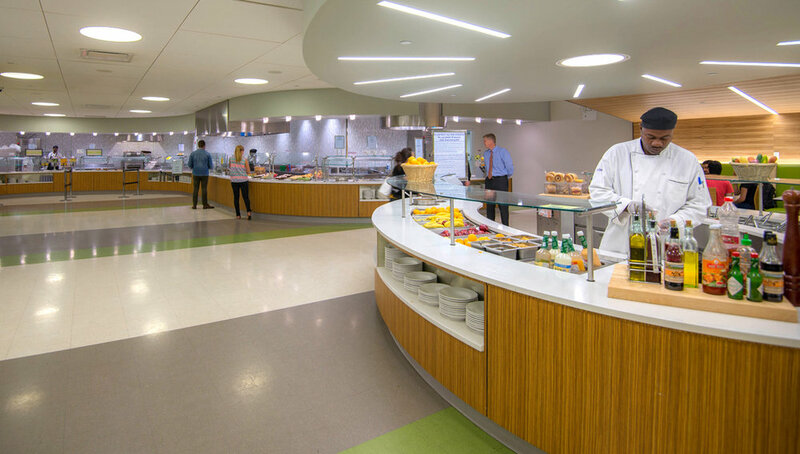 The Weinstein Dining Hall is located on the basement level of the building and consists of approximately 10,000 square feet of dining, servery and kitchen areas. Another design challenge of this project was to maintain the seating capacity of 236 people and improve the circulation of traffic in and around the dining area. This was accomplished by creating a continuously curved servery counter with multiple food service stations that are easily reached and identified upon entering the new front door of the Hall. The level of finish and lighting design amplifies the sophisticated requirements of the consumer in order to enhance the dining experience.